Caldwell wanted to free climb El Capitan’s Dawn Wall, a steep rock face with extreme pitches and hardly any vertical cracks (which climbers wedge hands and feet into to help them ascend). Collins wasn’t sure how to respond at the time, replying only that it’s not a BHAG if we know the outcome with certainty. Back at the conference, Jim Collins called healthcare leaders to action in a similar way: identify a Big Hairy Audacious Goal as massive and seemingly unattainable as El Capitan’s Dawn Wall. 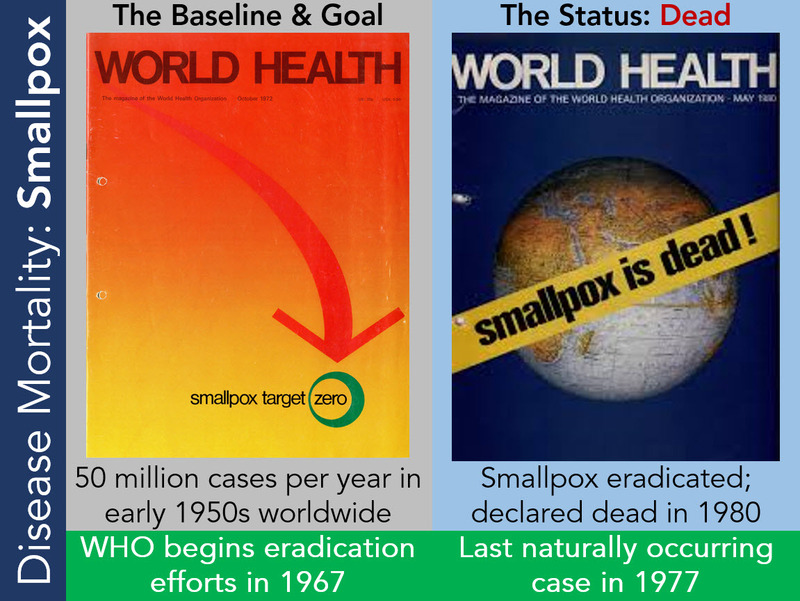 In 1959, the twelfth World Health Assembly adopted a BHAG to globally eradicate smallpox. Innovations in vaccination had made such a goal seem plausible, but it was still a rampant disease, with an estimated 50 million cases per year in the early part of that decade. Despite the challenge, a group of doctors and scientists persevered. By 1967, the World Health Organization (WHO) was leading an international effort at eradication. The last naturally occurring case happened in 1977, and in 1980, the WHO declared “smallpox is dead.” To use the climbing analogy, they reached the summit of the Dawn Wall. In 1962, Albert Sabin’s polio vaccine became part of a national effort to reduce polio. As recently as 1979, there were still an estimated 400,000 new polio cases a year. In 1988, eradicating polio became a global effort, and the WHO began tracking polio-endemic countries. In 1994, the Americas were declared polio-free and one after another, other countries soon followed. 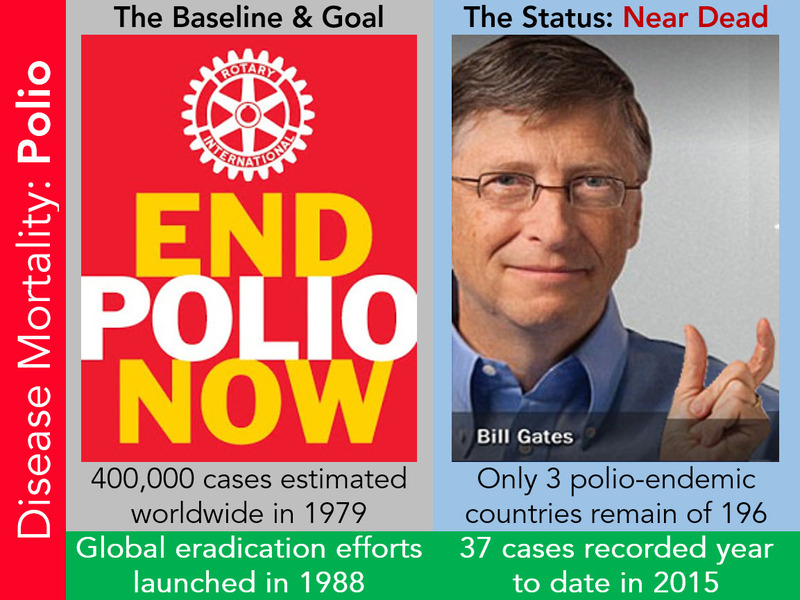 Today, polio remains endemic in only three countries and the End Polio Now campaign has featured international leaders like Bill Gates showing how close we are to full eradication. In climbing terms, the individuals targeting polio are on the Dawn Wall, near the top. Almost there. 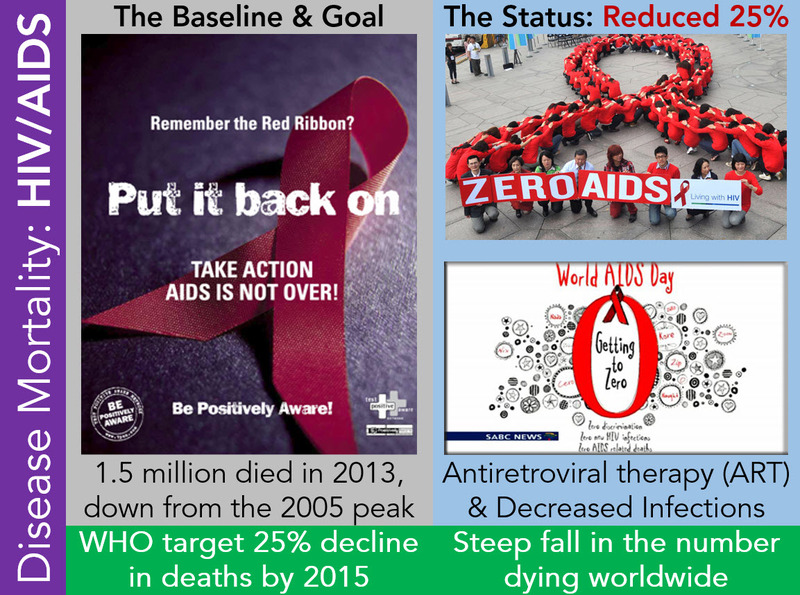 A meeting of United Nations member states in 2011 advanced 10 target milestones to eliminate HIV. “In the early years of the epidemic [prior to the discovery of HIV], AIDS was unknown and misunderstood, feared, untreatable and often fatal.” But progress is happening. Deaths reached their peak in 2005, and the WHO expects mortality to have declined 25% by this year. Efforts continue to focus on expanding access to antiretroviral therapy and reducing the incidence of infection. The teams with this goal are at the base of the rock wall, but steadily climbing. It is difficult for us to realize how humbling these efforts were when first identified as a BHAG, and how impossible they seemed to those who first set about their pursuit. Yet all three of these initiatives are at some stage of the rock climbing wall, whether at the base and making their way up, near the top, or standing atop the summit, victorious. As I write this on World Suicide Prevention Day 2015, it seems like the time is right for another seemingly impossible climb: eliminate deaths by suicide. It has already begun. Earlier this year, the World Health Organization produced a report “Preventing Suicide: A Global Imperative.” The United States National Action Alliance for Suicide Prevention envisions a nation free from the tragedy of suicide and created a prioritized research agenda to begin the work. Many in the United States, United Kingdom, the Netherlands, and New Zealand are inspired by the work of the Henry Ford Health System and are attempting to replicate their efforts. These are important first steps. On September 21, a diverse group of peer leaders, government policy makers, and healthcare providers from a dozen countries will gather in Atlanta, GA to continue the climb to the summit. 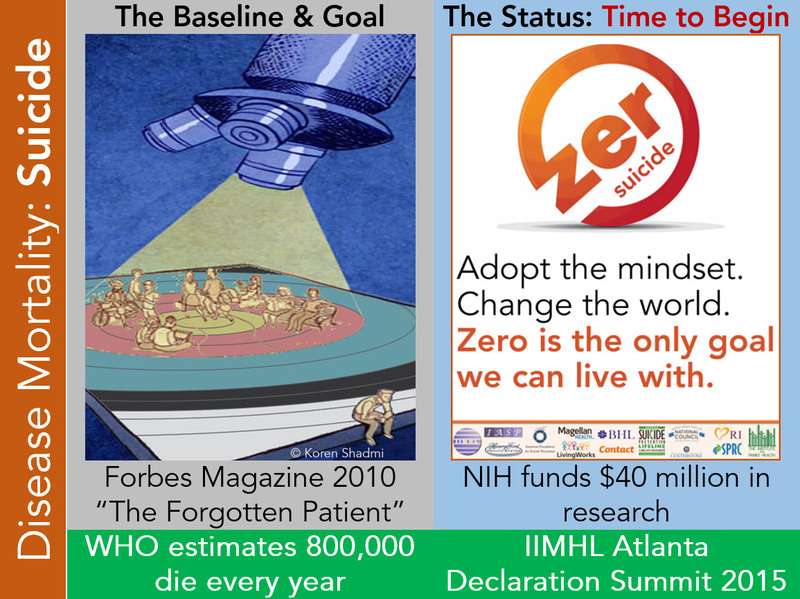 The “Zero Suicide in Healthcare 2015: an International Declaration and Social Movement” is a joint effort of the International Institute for Mental Health Leadership (IIMHL) and the International Association of Suicide Prevention (IASP). But we continue to climb upwards: The new edition DSM-5, which many will utilize effective October 1st, brings a stronger recognition of suicide related to diagnoses like Schizophrenia, Bipolar Disorder, and Major Depression. It also proposes for consideration Suicide Behavior Disorder, which would indicate an attempt within the past 24 months, and be applicable to those who may not have another mental health diagnosis. While the issue of stigma should not be underestimated, this is a BHAG for health and behavioral health. Past research did not include input from people with lived experience. In the case of smallpox or polio, we would likely say that someone “succumbed” and died. Regarding suicide, many experts continue to insist upon using the language of personal “choice.” This does not fit with the unbearable emotional and psychic pain that those who contemplate suicide experience and describe. Ultimately, we aim to continue the climb in Atlanta, with the intent to spark a global effort to reach the top. We hope to inspire health and behavioral health leaders to take on this challenge, like they have many other indomitable foes. It’s a BHAG, but without that, we would remain at the base of the mountain, forever looking up, but never making progress.